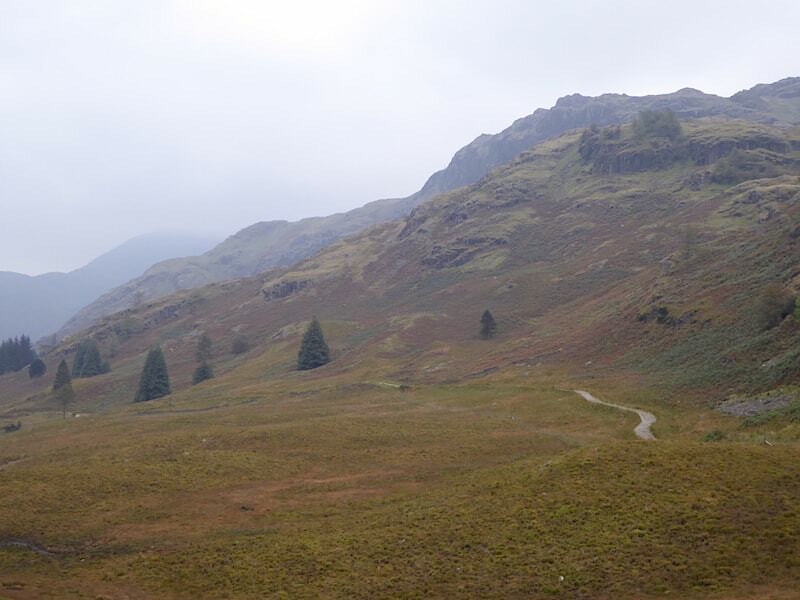 Poor weather has been the norm for the last couple of weeks but today was at least going to be dry if mainly cloudy, there seemed to be little chance of the fell tops being clear so we opted for a low level walk along Little Langdale. We’re only a week into autumn but already leaves are beginning to litter the ground. 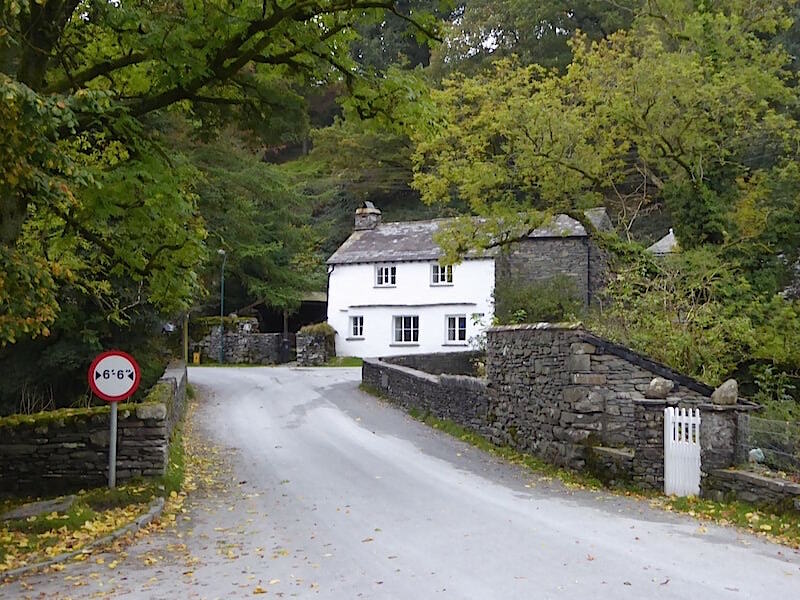 There’s hardly anyone around as we walk from the car park in Walthwaite Bottom towards the bridge over Great Langdale Beck in Elterwater. Its a dull and overcast morning but not at all cold, quite the opposite because its muggy and a little oppressive. 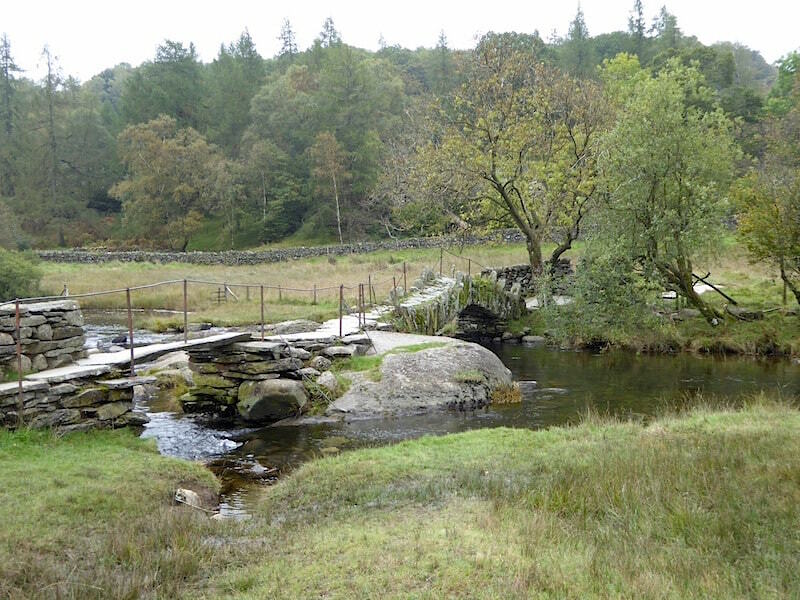 Beyond the bridge we walk along the road as far as the Eltermere Hotel where we will bear off to the right up a very rough track through Sawrey’s Wood. 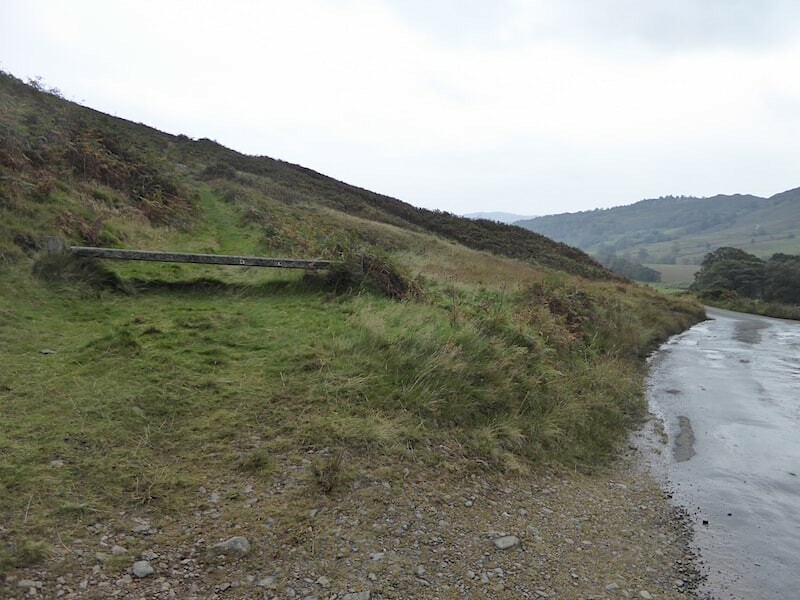 Heading up the rough and steepish track from the Eltermere Hotel …..
….. and a stop at the gate so J could remove his jacket. 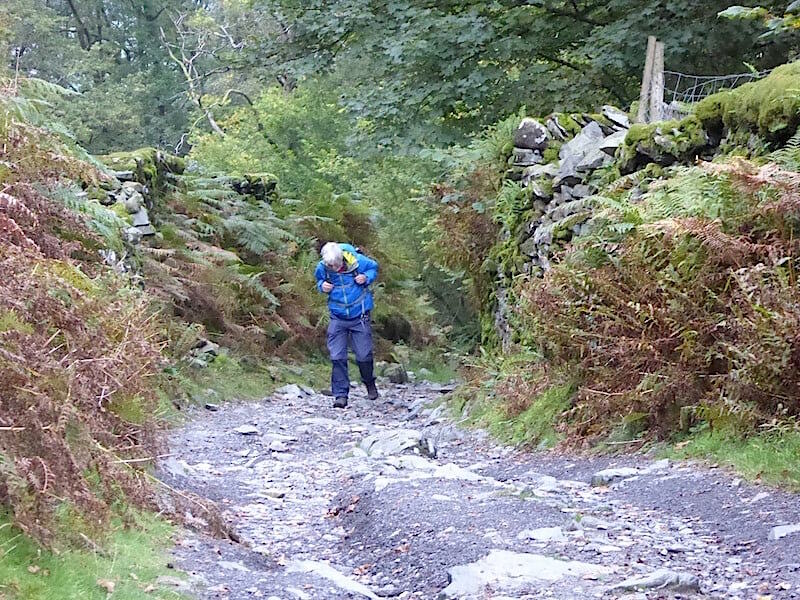 I did mention before we started walking that it wouldn’t be necessary to wear it, especially with a stiffish climb coming shortly after we set out, but did he take any notice? Beyond the gate the path levels out a little but there’s some more uphill work to be done. As I walked up the path to the right of this shot I noticed a man standing beside the wall ahead of me in what I can only describe as, for him, a potentially embarrassing stance. To spare his blushes I turned to face this way so he might not realise I had seen him. When J caught up with me I took this shot looking down the path we had just walked up, simply to give the man enough time to get some way ahead and forget about us. 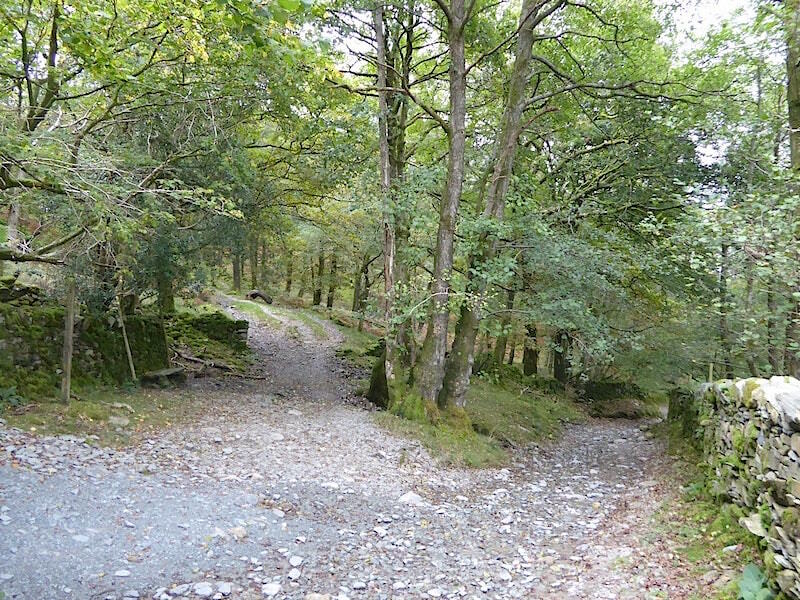 The path on the left eventually leads down to the Burlington slate quarry and there are other paths leading off it which will take you over to some older and now disused quarries. 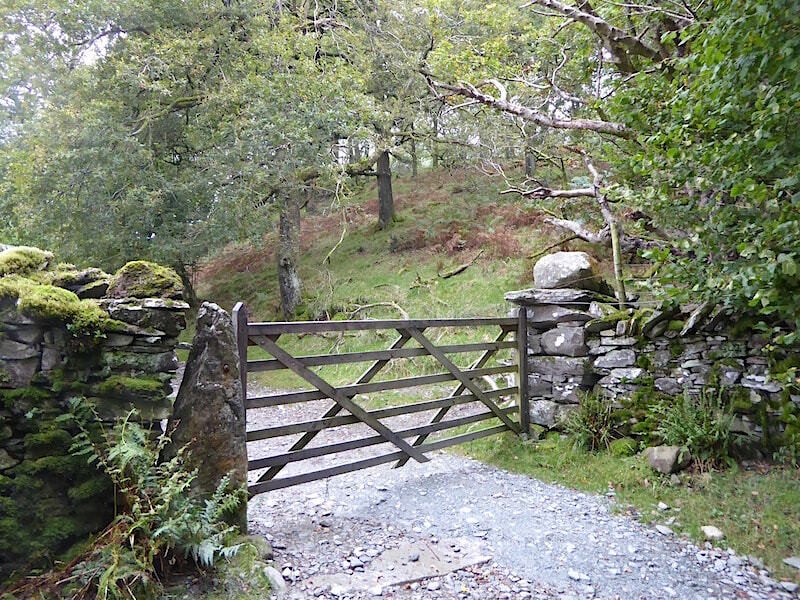 Beyond the gate at this point the track levels out and we begin to make our way towards Little Langdale. 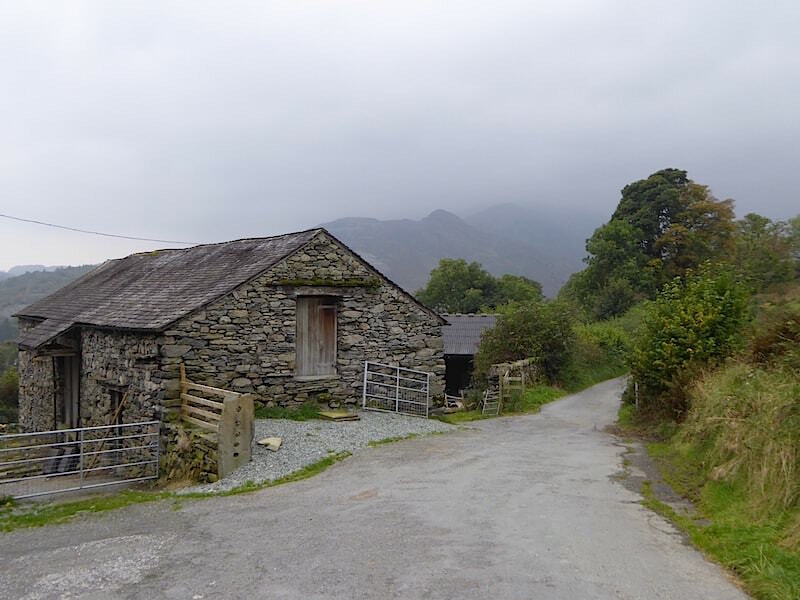 Passing by the outbuildings of Dale End Farm and the view ahead is looking very murky indeed …..
….. while at this end of Little Langdale the clouds are much higher and the light is much brighter, even though there is no sunshine. It was to stay just the same for the rest of the walk, almost as if the clouds had decided that they weren’t going to go anywhere else today. Beyond Dale End Farm the track continues on below Lingmoor Fell and eventually meets this road which runs along Little Langdale and then on up Wrynose Pass. We’ve just made a left turn at that junction followed by a right turn to where I’m standing now. 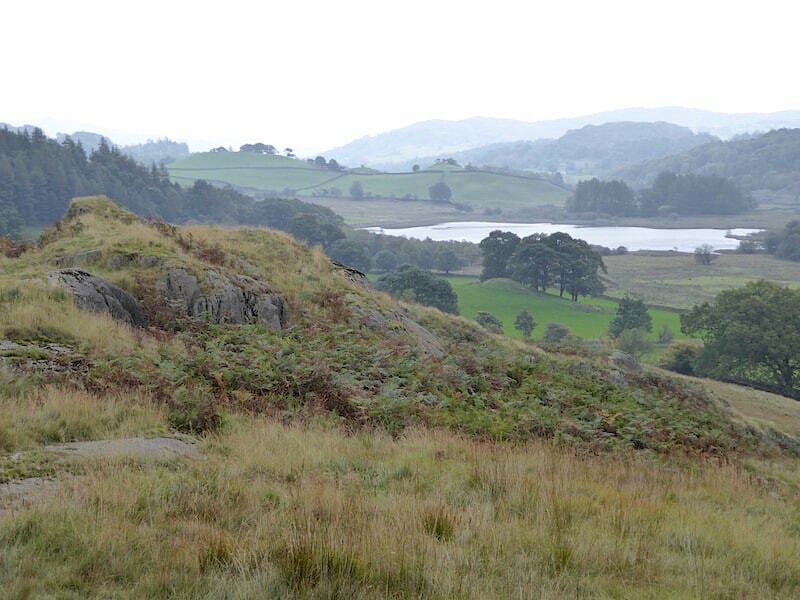 From here we follow the path …..
….. across the fields with Little Langdale Tarn and some very cloudy fells on our right. 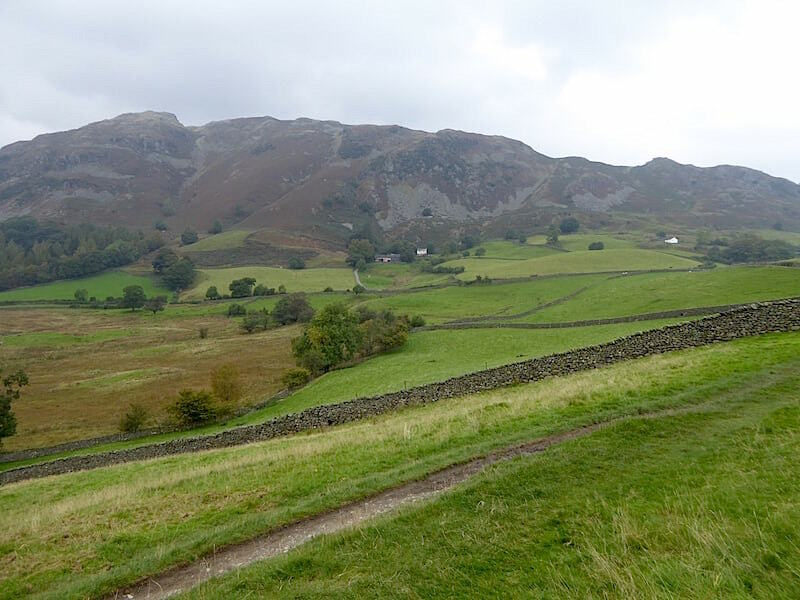 The path hugs the wall over to the left and beyond the fields just about the only things visible are the old spoil heaps littering the slopes of Great Intake. Lots of work going on at the farm just over the wall, the wooden fencing seemed to be part of some new stock pens. 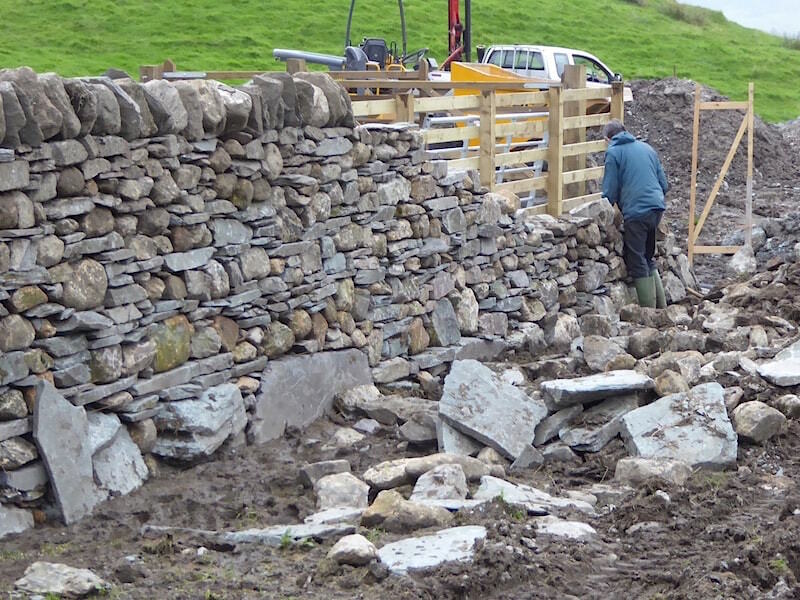 The dry stone waller was too busy concentrating on his work to even notice me peering over the wall. 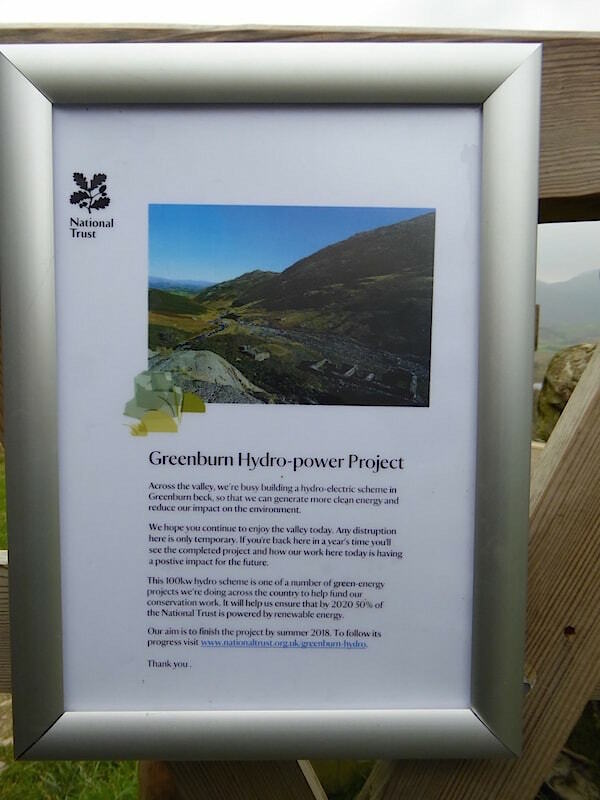 At the gate a notice telling us that The National Trust is creating a hydro-electric scheme in Greenburn Beck and that it will only be a temporary disruption. We weren’t disrupted at all and it wasn’t until we reached Bridge End Cottage that we noticed a couple of JCB excavators standing along the distant beck side. 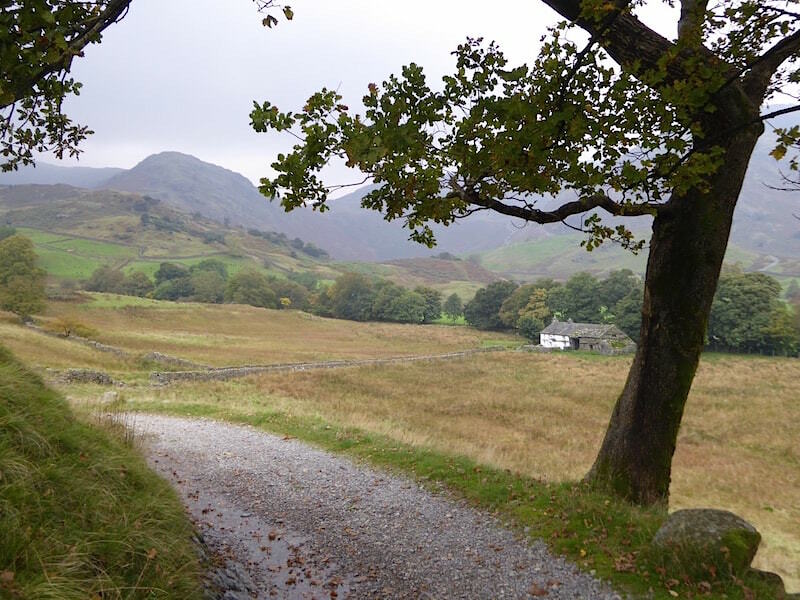 A look back across to Lingmoor Fell as we make our way over to Slater Bridge. 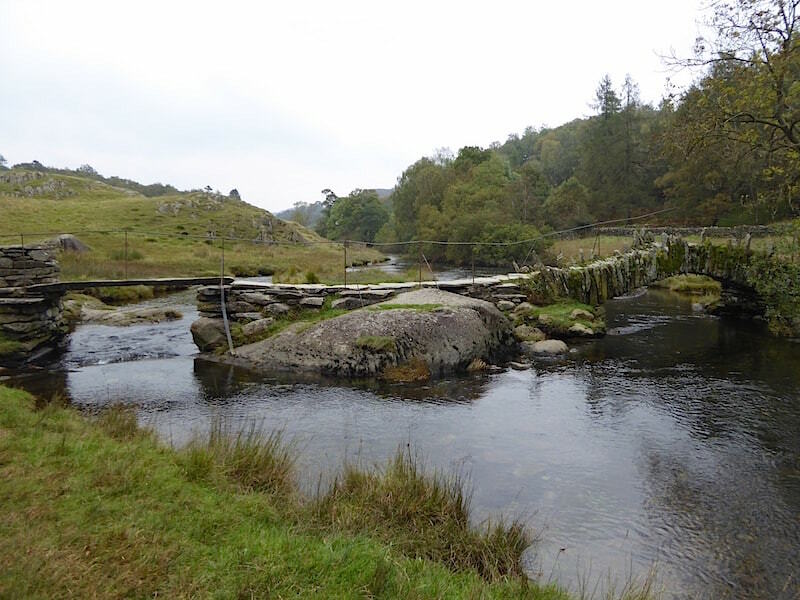 The very charming and much photographed Slater Bridge, and a few more views of it to follow …..
We finally get around to crossing the bridge …..
….. where I take another from the other side just as three walkers arrive. I suppose we were lucky to have no-one around for as long as we did. 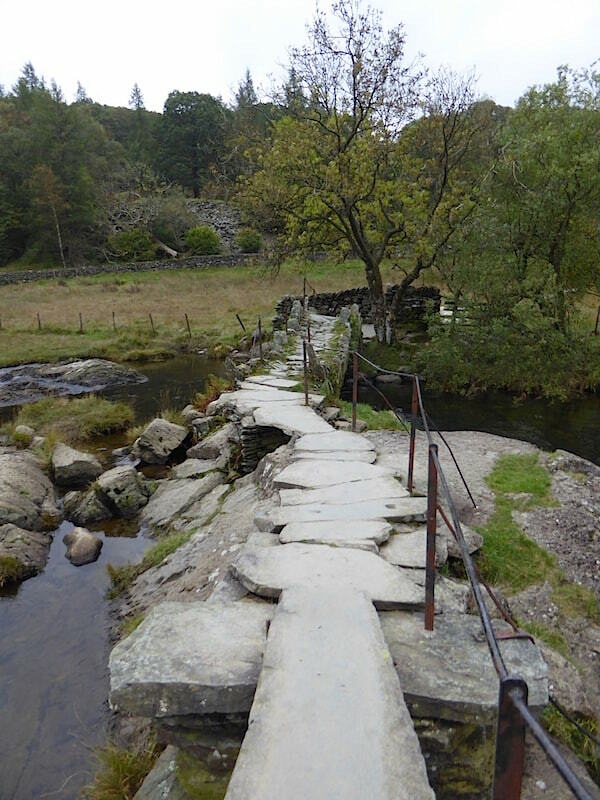 From the bridge we join the Little Langdale path eventually arriving at Low Hall Garth and just around the corner is …..
….. High Hall Garth, complete with something which appears to be and what used to be called a ‘guzunder’ standing on the ledge beside the door. In polite parlance it was a chamber pot for night time use before indoor lavatories became the norm and usually it would be placed out of the way under the bed, hence the name ‘guzunder’. We were discussing guzunders, as you do, when we realised that the kitchen window was wide open. Sure enough the door opened and out came a lady, still in her dressing gown, and wished us a cheery good morning. From the open kitchen door came the delicious smell of frying bacon which was especially tormenting as it was now 11.30 am and quite a while since we’d had our breakfast. There’s something irresistible about the smell of fried bacon, just as there is with fish and chips. 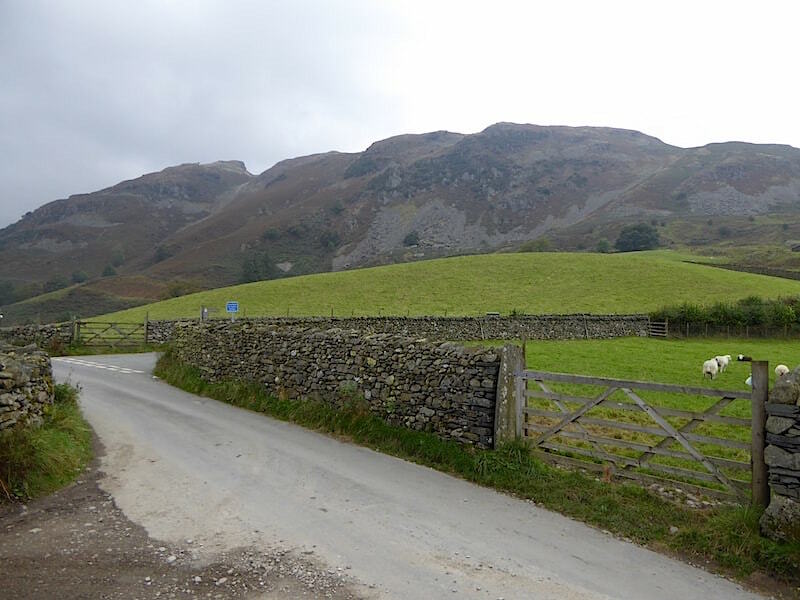 The fried bacon aroma drifts away down the valley and we continue on past High Hall Garth where we stop to remove the mid layers as we’re feeling quite warm now. It still isn’t sunny but its bright enough although quite hazy. 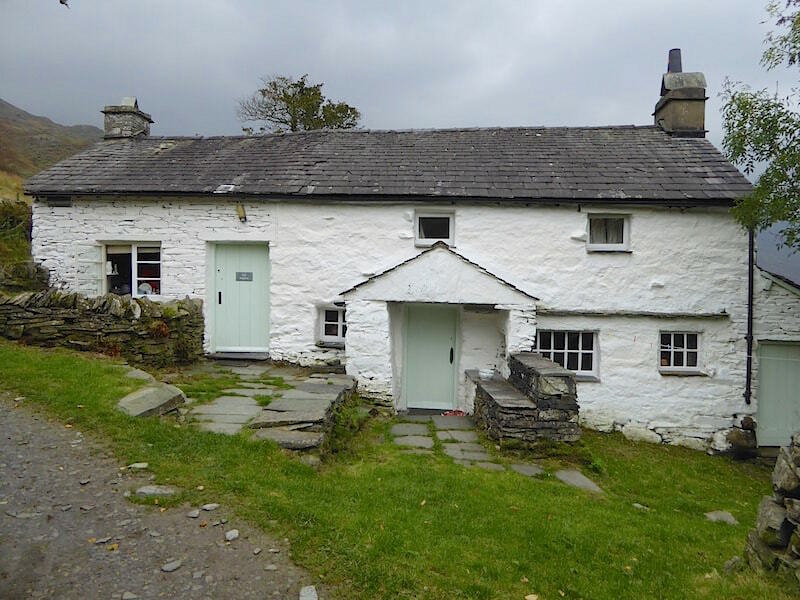 On we go, making our way over to Bridge End Cottage and, apart from the lady in the dressing gown, we haven’t met anyone else so far. 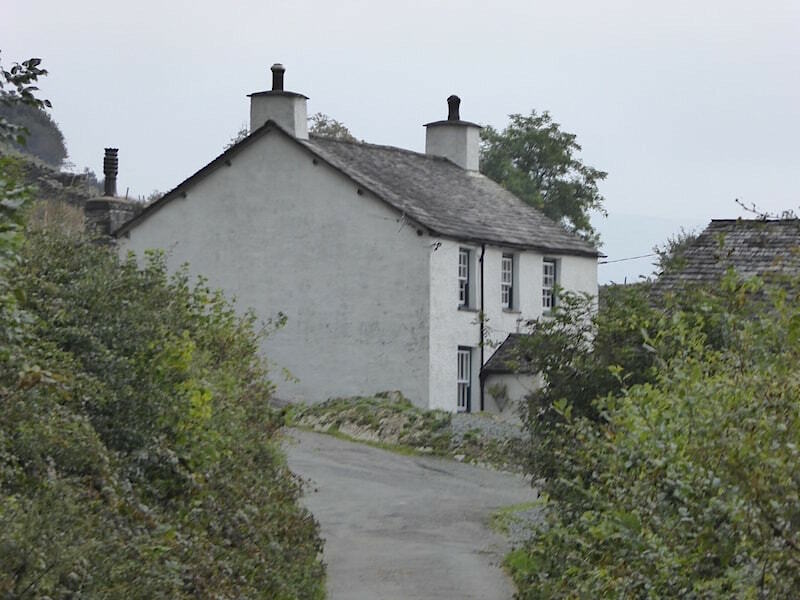 Almost at Bridge End Cottage and its so quiet its almost spooky. 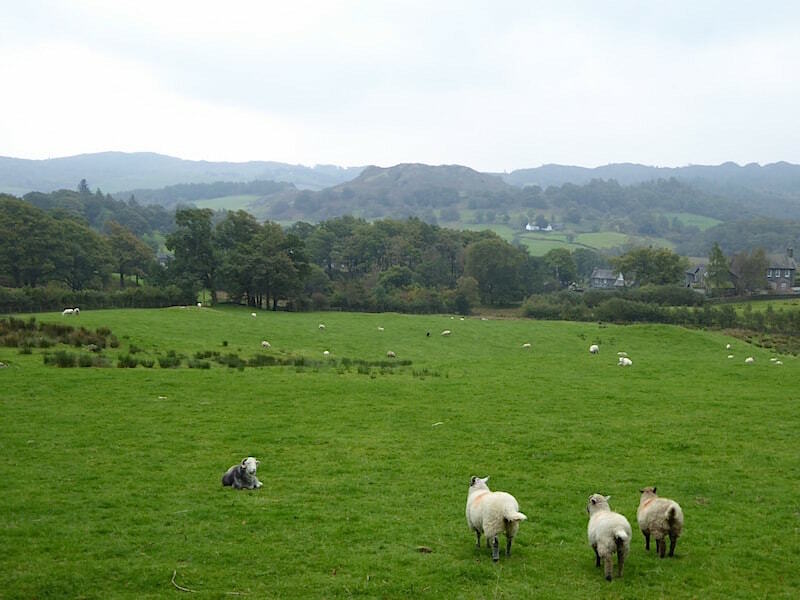 Looking towards the Greenburn valley with soggy fields and grey skies all around us. The JCB’s are out of shot over to the left with workmen standing around them so there wasn’t a lot of digging going on at the time. 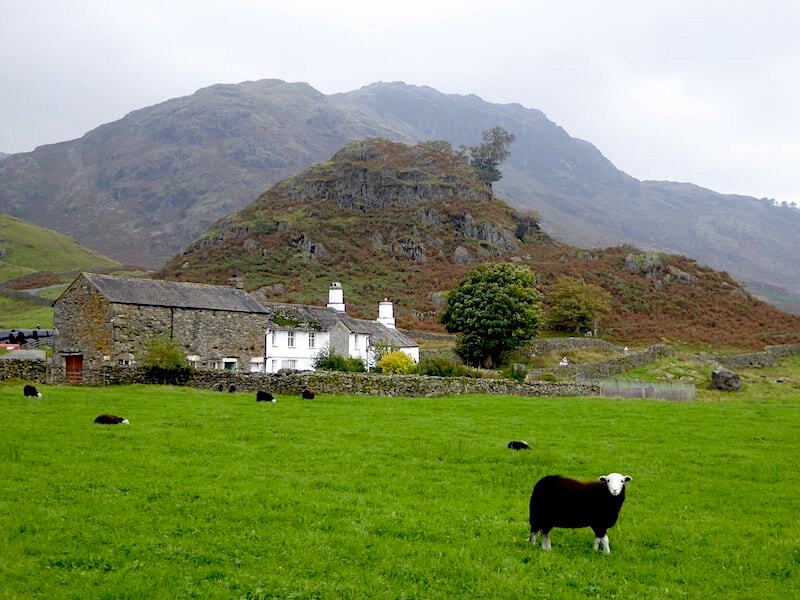 Fell Foot Farm below the rocky Castle Howe with Blake Rigg behind that. We are obviously of great interest to the young Herdwick in the foreground. We reach the end of the path just below Fell Foot Farm and have to take a left turn for a short spell of steep road walking on the Wrynose Pass road. 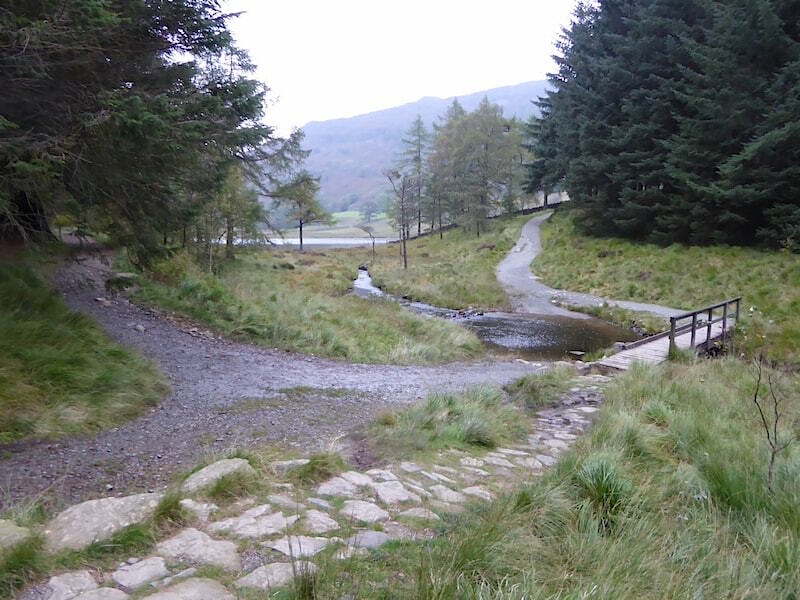 When we leave the road we carry on across the Blea Moss path, to the left of the shot, below Hollin Crag. 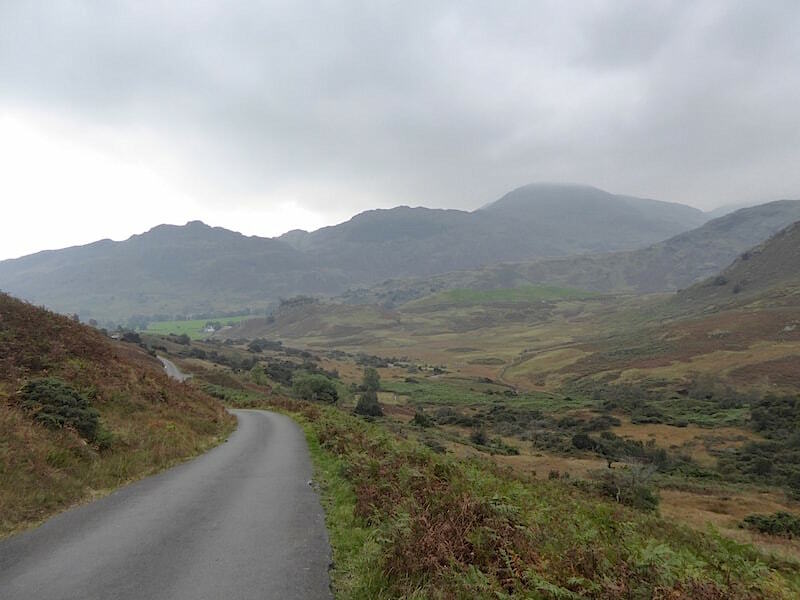 The view to our right, as we toil up the Wrynose Pass road, is of Tarnclose Crag, the small mound in the centre, and the more prominent Side Pike over on the right. 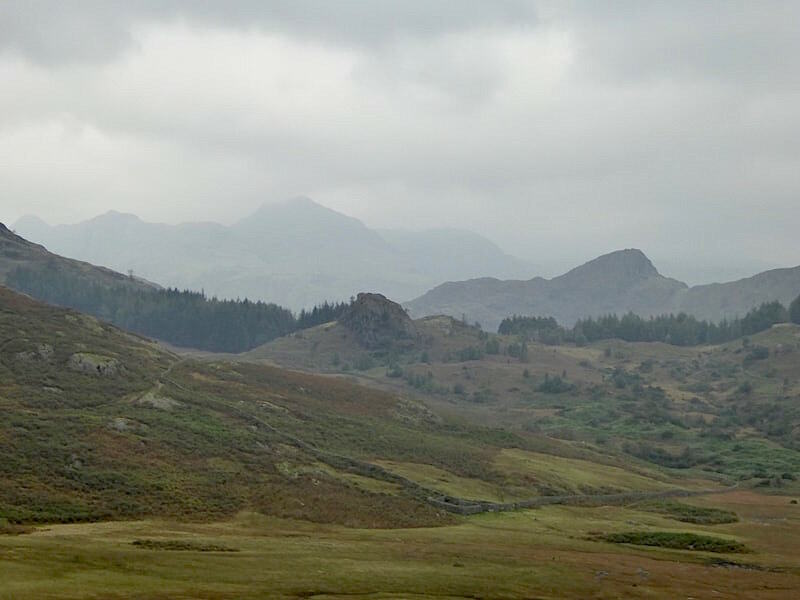 The Langdale Pikes are only just visible in the general gloom. 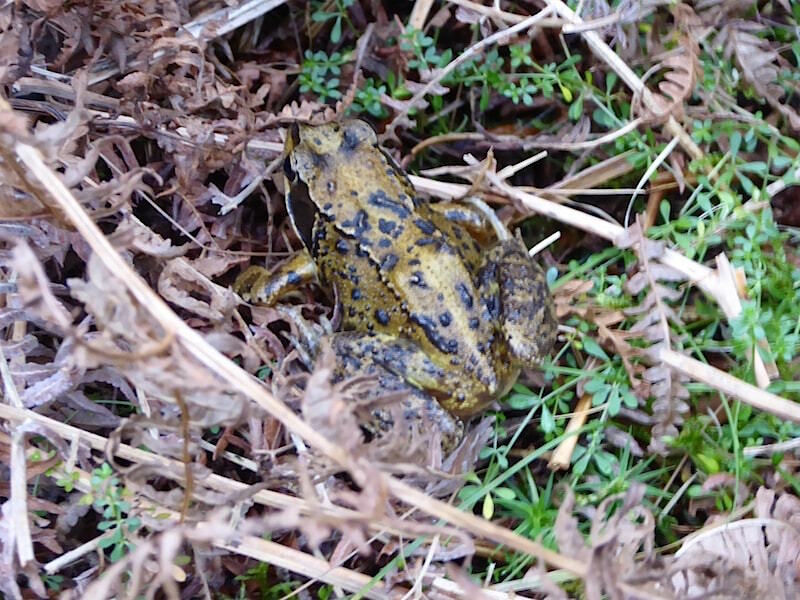 On the Blea Moss path now and the saturated conditions are just perfect for this little frog which didn’t seem at all concerned by our presence. 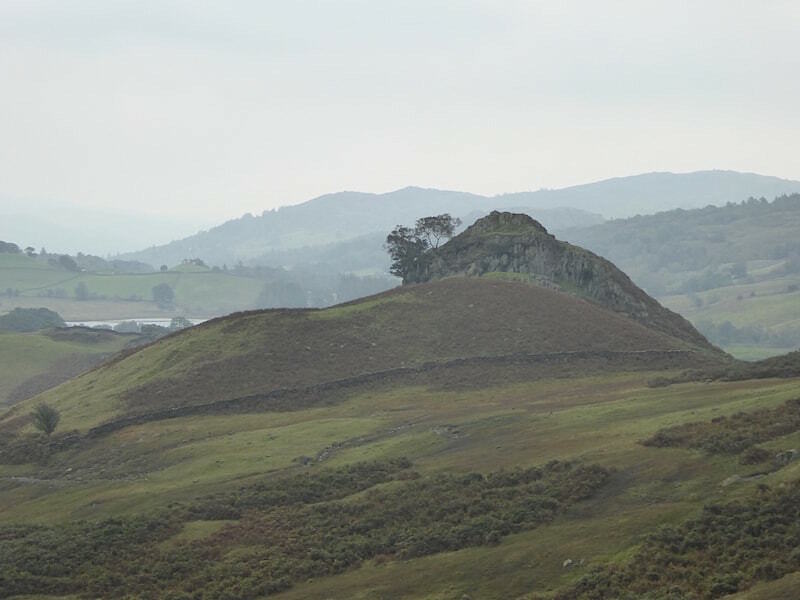 Looking southwards across Blea Moss we get a view of the other side of the rocky Castle Howe. 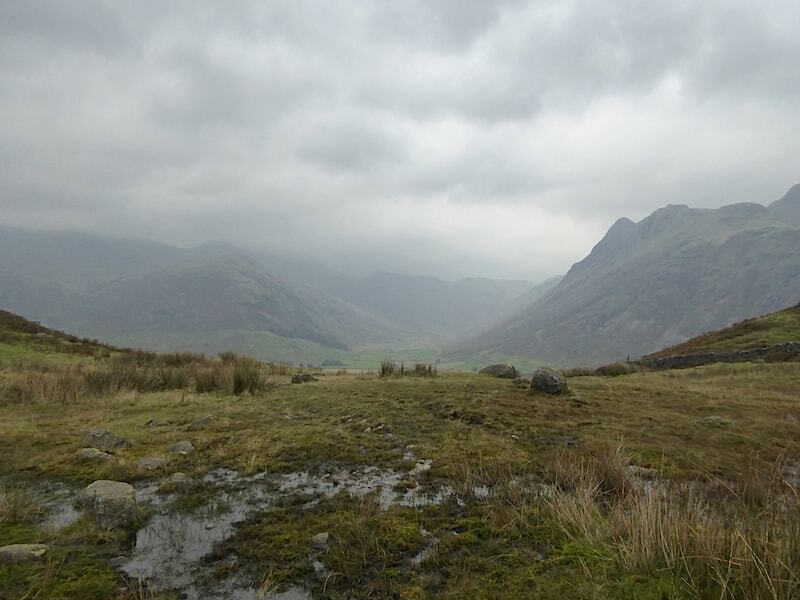 The lighter skies are still present back there so we had two quite different weather conditions along the same valley today. Once beyond Blea Moss the path conditions improved and we made much better progress. 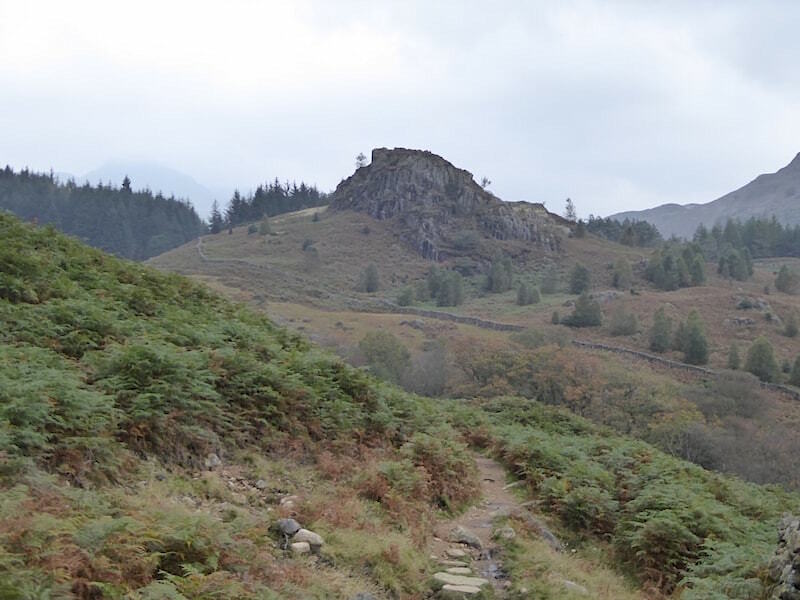 Here we’re heading towards Tarnclose Crag beyond which we will arrive at Blea Tarn. 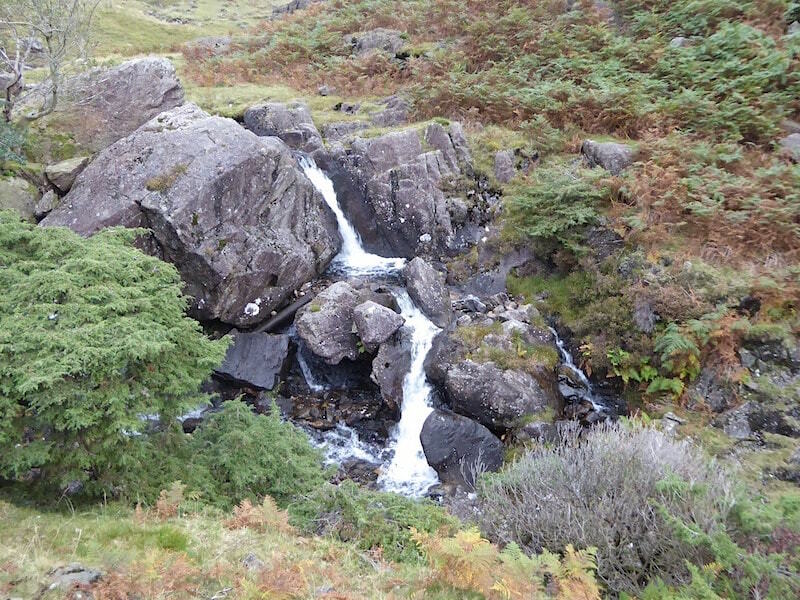 The path runs alongside Bleamoss Beck, with some attractive waterfalls along its route, which eventually leads us to …..
….. the Blea Tarn outflow. 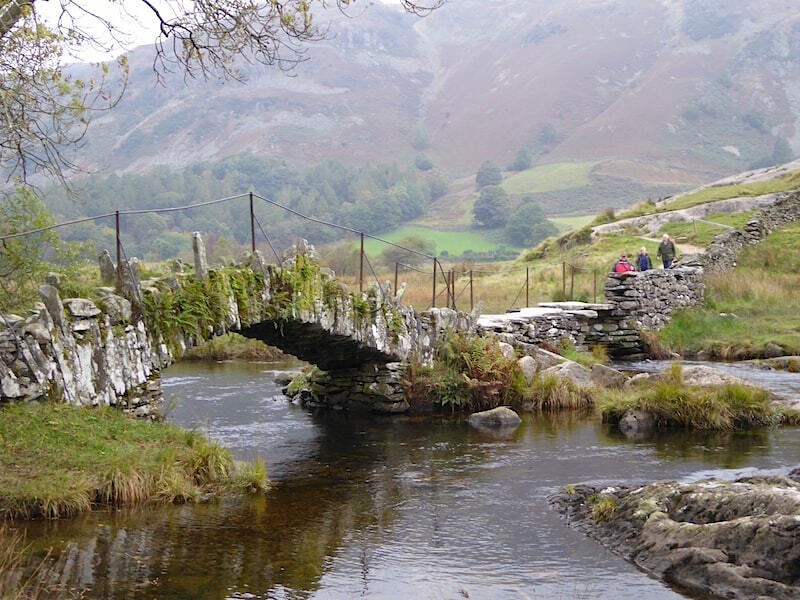 We don’t cross the bridge but take the path on the left which takes us over to …..
….. Blea Tarn with its backdrop of Side Pike and the Langdale Pikes, although none of it is looking at its best today. We’re now under heavy grey cloud and there’s quite a strong and nippy breeze blowing so the mid layers went back on. 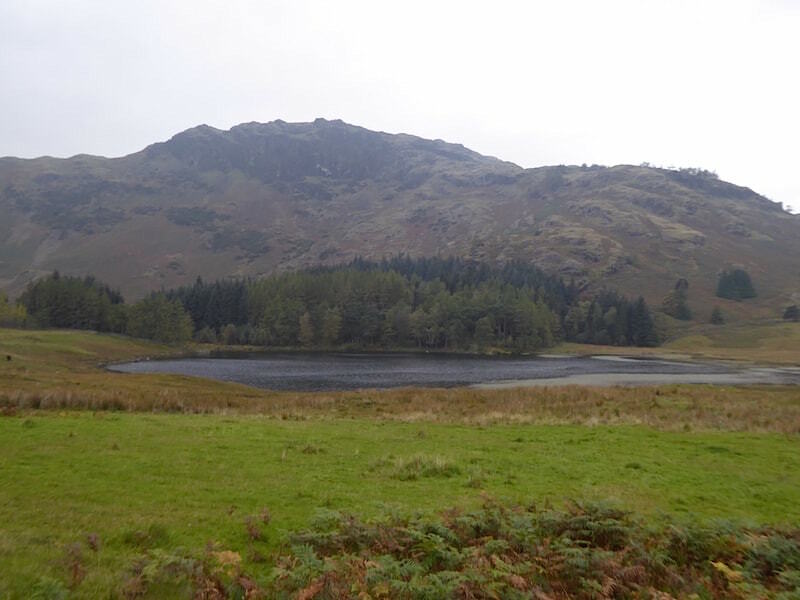 At the head of Little Langdale it was even gloomier, windier and nippier so the jackets went back on as well. 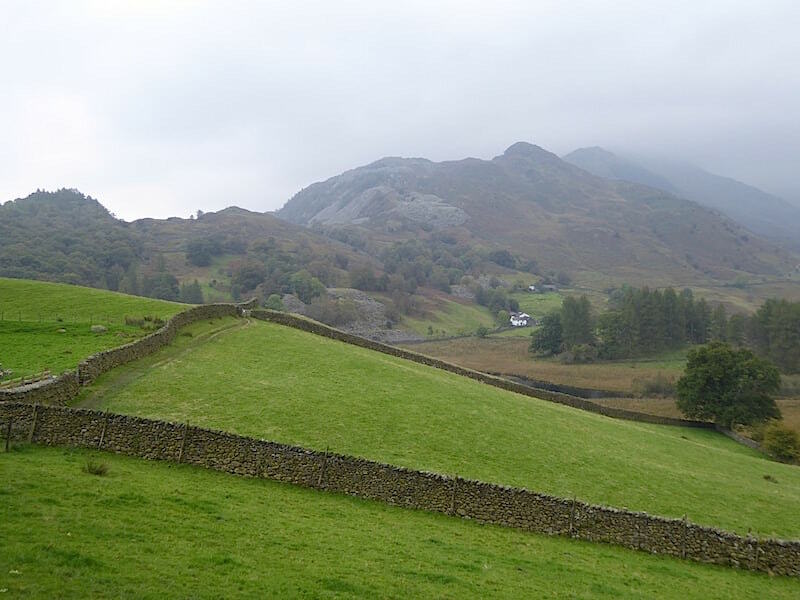 We could just about see along Mickleden and the Langdale Pikes alongside it, virtually everything else was greyed out. It certainly wasn’t a good day to be out on the high fells. 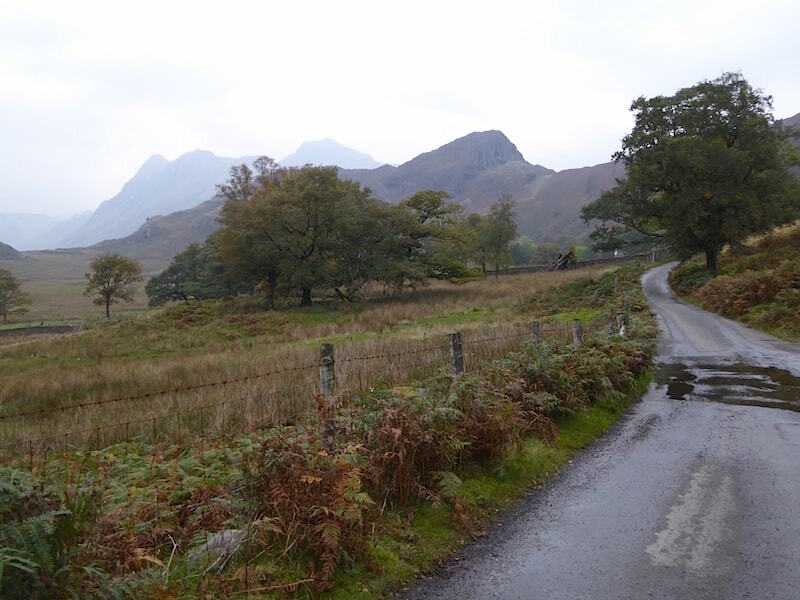 Out of shot to the right is the road coming up from Little Langdale which is about to drop down into Great Langdale and that’s where we will start the return leg of our walk. 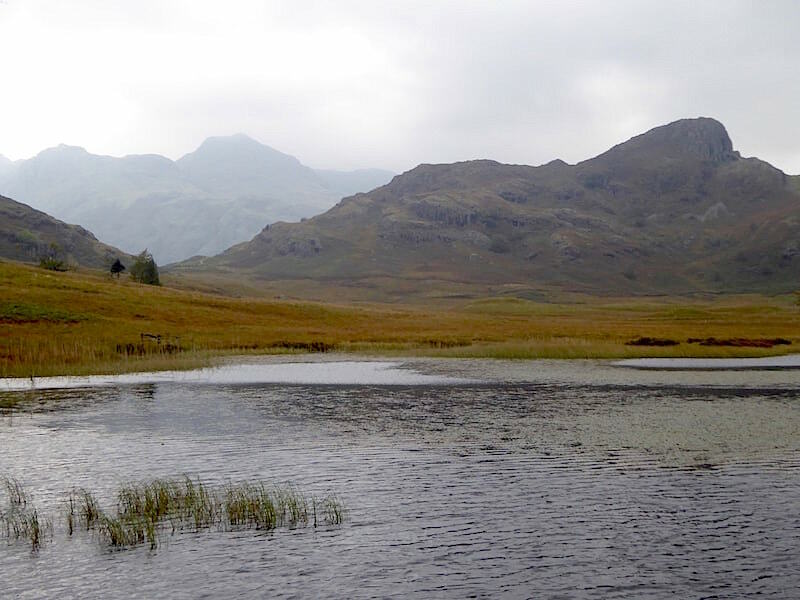 Blea Tarn re-appears as we make our way down the road and into Little Langdale once again. 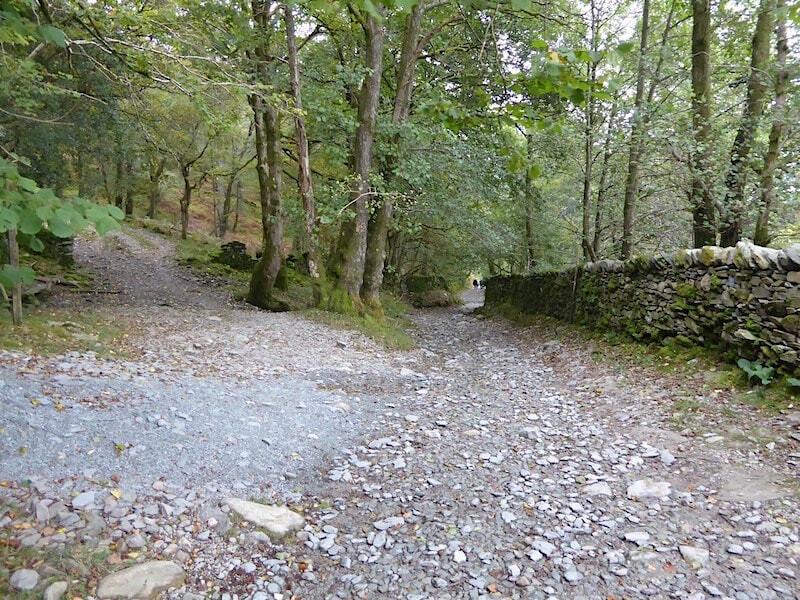 Over to the right is the path below Blake Rigg which we’ve just walked along. 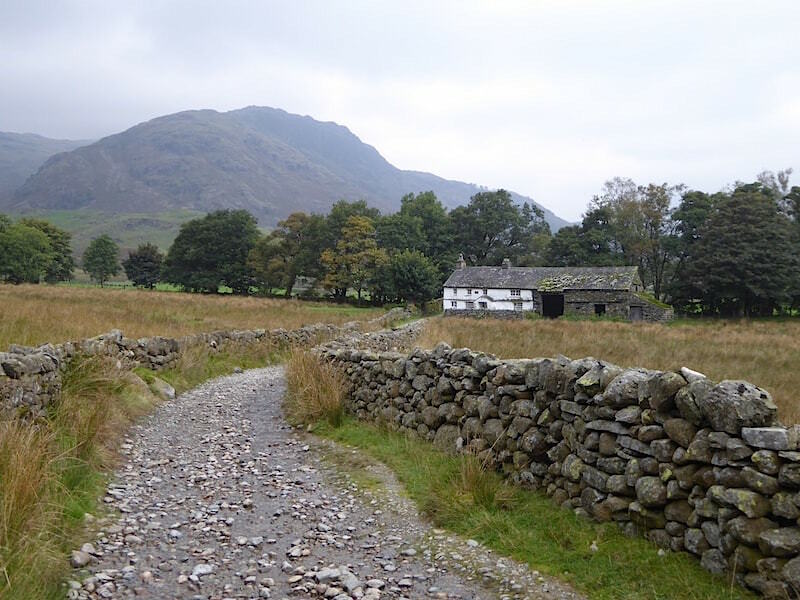 Further down the road we are now on we came to the path leading up to the col between Side Pike and Lingmoor Fell. 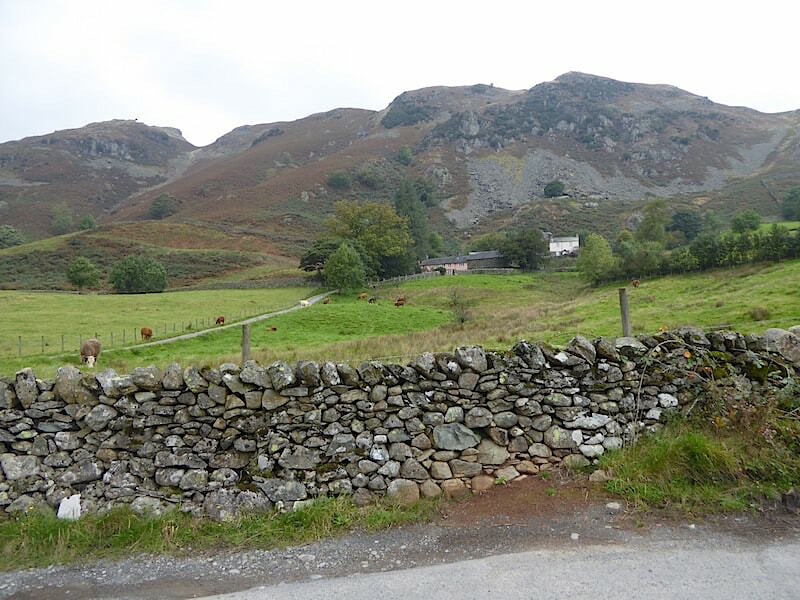 We thought about following it and returning to Elterwater over Lingmoor Fell, but after mulling over the pros and cons we decided against it, mainly because the views just wouldn’t be worth the effort. 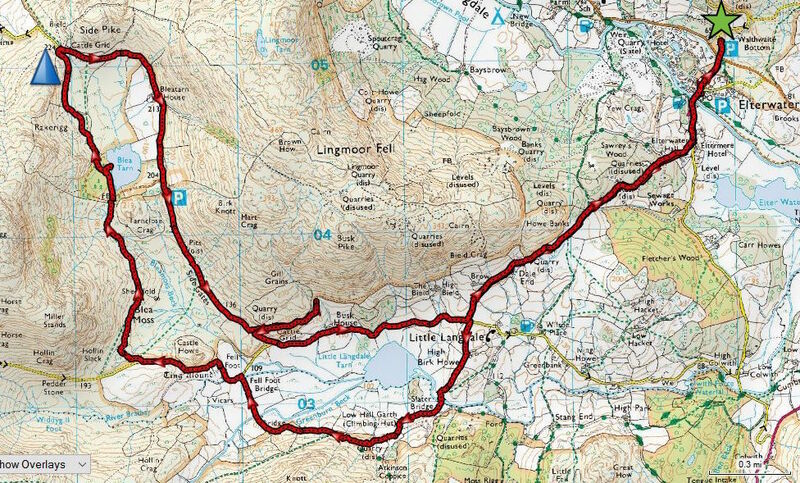 There is a path up Lingmoor Fell from Bleatarn House and once again we hummed and haahed about going up it, and again we decided not to bother. 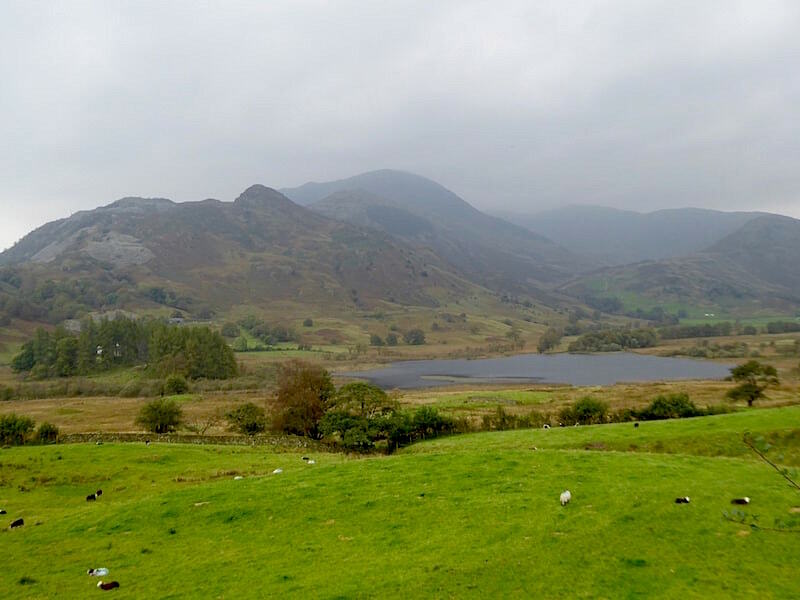 A view across to Blea Tarn with Blake Rigg beyond it …..
….. and a look back from the same place for another look at the the Langdale Pikes before the view is lost to us. That’s not blue sky up there, its just another shade of grey. 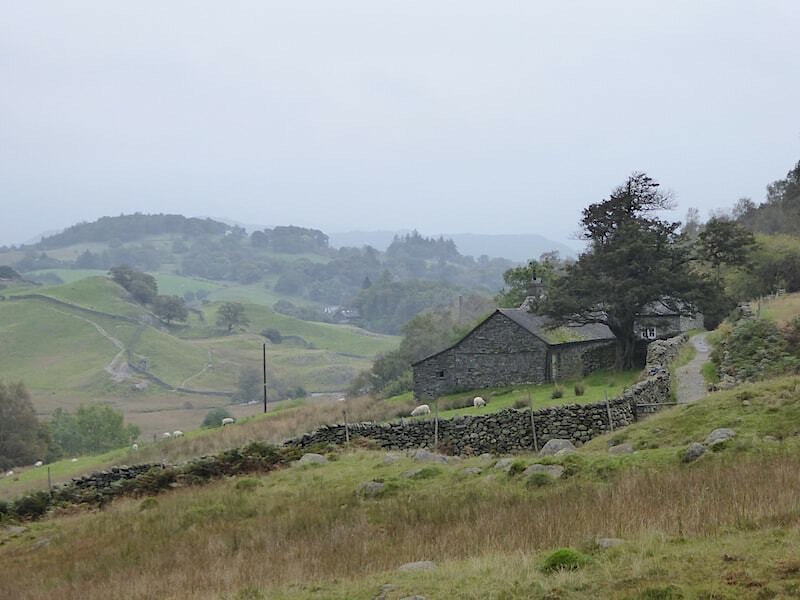 A dull, damp and dreary scene ahead of us as we continue down the road towards the Fell Foot junction. 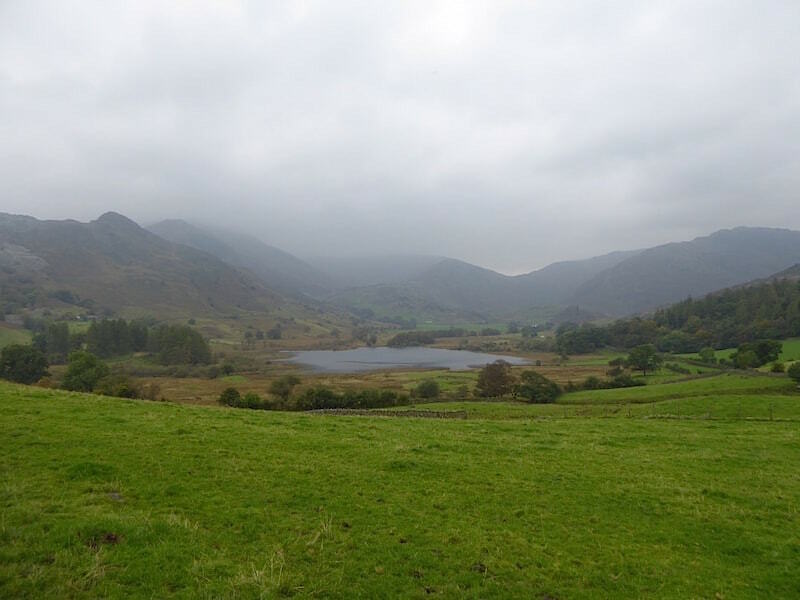 The higher fells never quite lost their cloud cover today. Just before the Fell Foot junction is this path off to the left so, as it was quite clearly marked on the OS map cutting across the lower slopes of Lingmoor Fell, we decided to use it and put an end to the road walking. 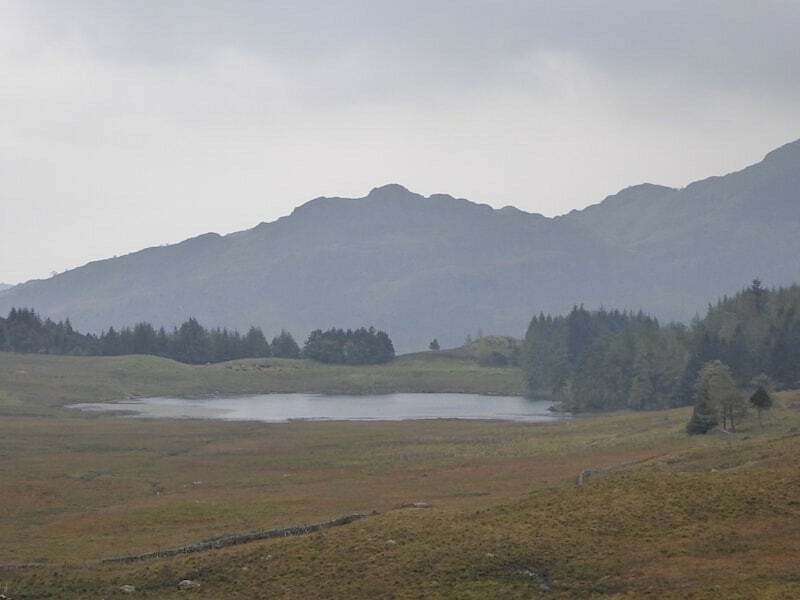 From this very, very wet path we have a view of Little Langdale Tarn and the lighter conditions which were still prevailing at the end of the valley. We continued on the path until we dropped down towards a gill in spate. 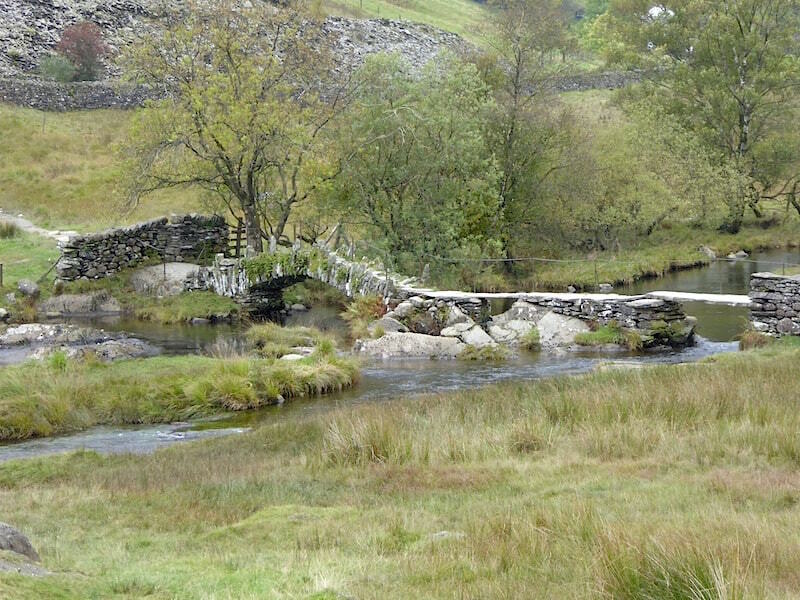 There was no bridge so presumably the crossing would normally be made using the stones in the bed of the gill, but that was never going to be a goer today. Quite apart from that we could see no sign of a path continuing beyond the gill despite hunting around for a few minutes. Maybe it will be more obvious once the bracken has died back. Anyway there was nothing else for it but retrace our steps and go back down to the road. 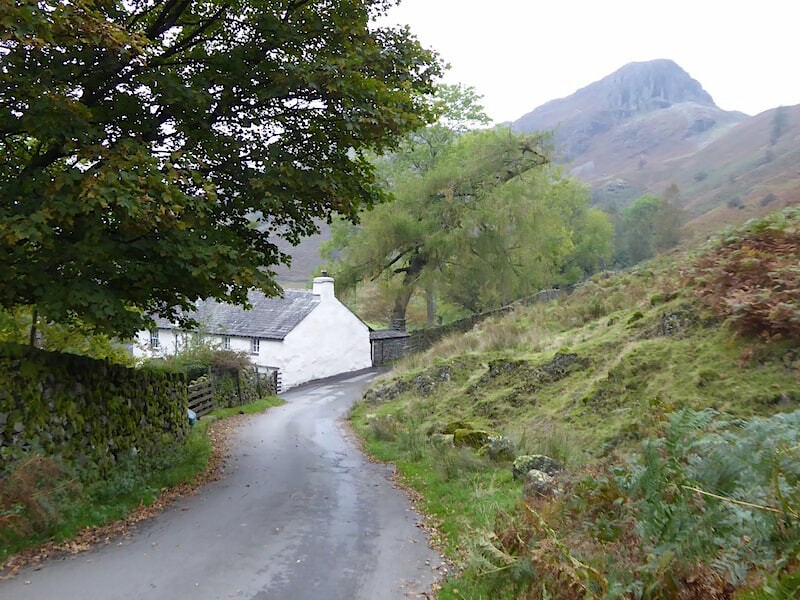 We’re back in the muggy brightness once again as we pass The Bield, which is the house nestling at the foot of Lingmoor Fell. 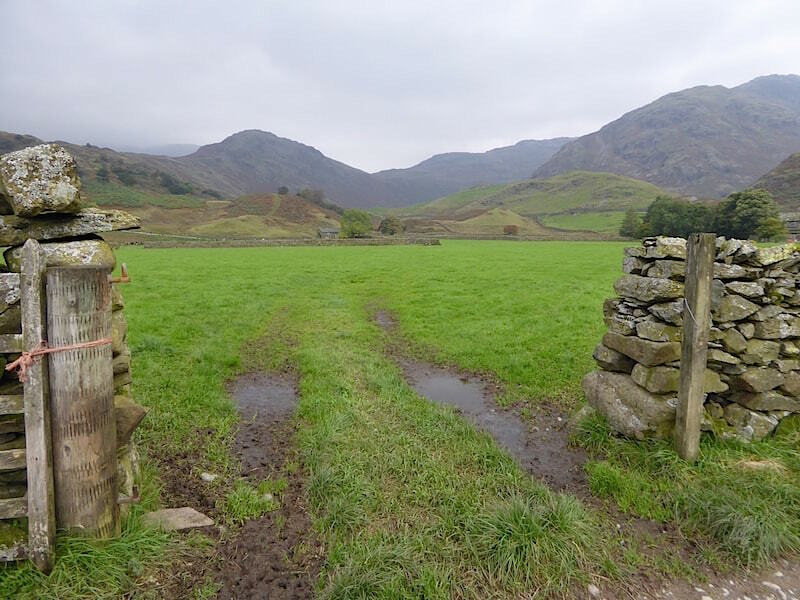 This is really weird, being back in exactly the same weather conditions at this end of Little Langdale as we started out in this morning, with the conditions at the other end of it not having changed one jot either. Needless to say the jackets had been taken off again a good way back up the road. A very odd day of weather. 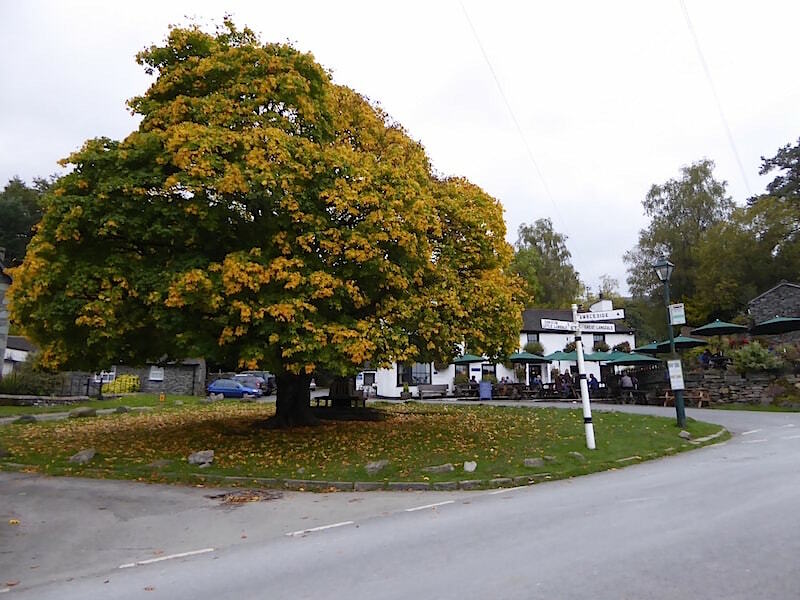 Dale End Farm comes into view once again from where its just a short walk back to …..
….. the rough track down through Sawrey’s Wood to Elterwater …..
….. and the gold and green maple tree in front of the Britannia Inn in the centre of the village. A handful of people were sitting outside the pub enjoying some liquid refreshment, which was more than we’ve seen during our entire walk. 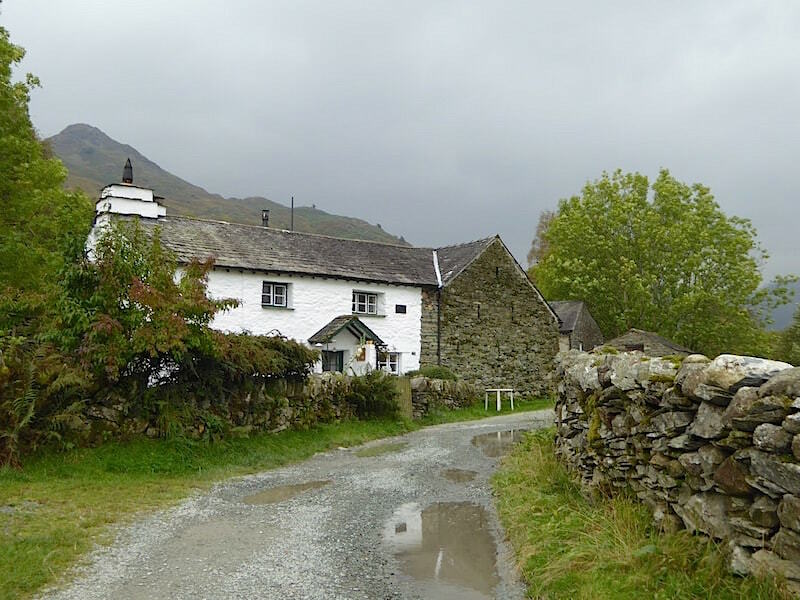 A short walk along the road to the right and we’re back at the car park in Walthwaite Bottom. Its been a very weird day of weather and very few people were out walking. Nevertheless its been good to get out and get some fresh air and exercise despite the gloomy conditions.